AT&T Raises Early Upgrade iPhone Prices, Canada To Follow? Last week, Android Central posted a screenshot that showed smartphone price changes coming to AT&T. 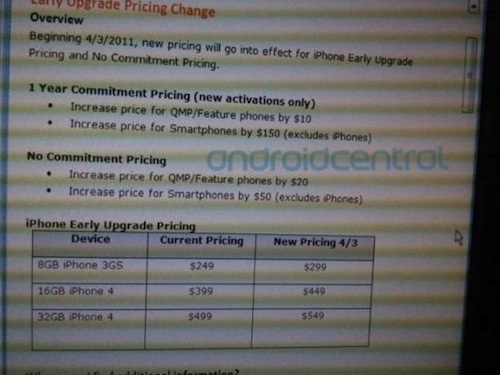 Based on the screenshot, AT&T was (and has) increased “early upgrade” pricing by $50 for all iPhone models. An early upgrade in this case means a customer who is on-contract and has not yet reached their eligibility point to get a new device at full discount.Â Based on the new pricing for AT&T, an early upgrade iPhone 3GS now costs $299 (was $249), an iPhone 4 16 GB costs $449 (was $399) and an iPhone 4 32 GB costs $549 (was $499). It is good to note the change made by AT&T, as AT&T policy updates sometimes have an effect on the Canadian carriers. 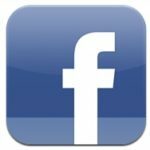 At this time, Rogers/Bell/Virgin Mobile/Fido have not increased early upgrade pricing for any iPhone devices. These carriers simply do not allow customers to renew their contract early to get a new device until they have reached their eligibility date (unless there is a promotion). In the last few years however, Rogers/Fido have allowed customers to upgrade early, in most cases at full promotional pricing, whenever a new iPhone was released. Telus on the other hand has recently introduced a type of price increase for early upgrades, but it is not a flat $50 fee like with AT&T. With Telus, customers pay a monthly fee for every month they are upgrading early before their eligible date plus the promotional cost of the iPhone device. If you have a regular Telus device, then your Early Device Upgrade Fee is $5.00 x number of months remaining in the contract. On top of is, you pay the promotional pricing for your intended device on a 3-year term. If you have a â€œsmartphoneâ€, such as a Blackberry, then your Early Device Upgrade Fee is $10.00 x number of months remaining in the contract. On top of is, you pay the promotional pricing for your intended device on a 3-year term. Lastly, if you have a â€œpremiumâ€ phone, such as an iPhone, then your Early Device Upgrade Fee is $15.00 x number of months remaining in the contract. On top of is, you pay the promotional pricing for your intended device on a 3-year term. It will be interesting to see if the other Canadian carriers adopt a similar pricing strategy to Telus, go the way of AT&T by increasing early upgrade prices, or do nothing. Let’s hope for the latter, especially in terms of price.